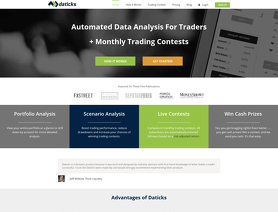 Daticks provides portfolio and scenario analysis for traders to improve trading performance and minimize drawdowns. Additionally, our traders compete in monthly live trading contests where the winners are determined on risk adjusted returns and win cash prizes. The trading dashboard analyzes historical account trade data showing how, using certain metrics a trader would have been able to maximize the account value and/or minimize the account losses. This can also help determine when a strategy is no longer worth trading. Traders quickly and securely link their live or demo trading accounts to the platform for analysis while only live accounts are entered into the monthly trading contests. All of the traders live trading accounts will be included in the monthly trading contests allowing users to link and compete with a portfolio of accounts instead of just one of their accounts. Traders can connect their accounts at any MT4 broker (NinjaTrader / Interactive Brokers coming soon, more to come after that! ).